Traditionally-built wooden canoes are a big part of Canada's history and the perfect way to enjoy your surroundings at nature's pace. They are the blending of form and function, graceful curves, and glowing varnish that gives pleasure to body and soul. Your browser does not support inline frames or is currently configured not to display inline frames. Built for those who are not satisfied with ordinary standards. Will Ruch's skilled hand is on every step of building a canoe from the milling of the rough-sawn wood to the final velvety smooth varnish. He carefully seals and fastens every joint to ensure a long life; Will Ruch's canoes will last over 100 years if properly maintained. 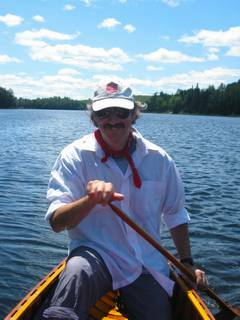 The 15 and 16 foot cedar canvas canoes are a combination of the early Peterborough design and other boats that he has seen and paddled. Will Ruch's design balances historical accuracy and aesthetic value with an artistic statement. A Ruch canoe is defined by the curve of its lines and its many refined details. Each canoe is signed and numbered. In a pre-building interview, Will carefully matches the canoe with the customer's needs. Will's goal is to build a canoe that will bring years of satisfaction to the customer as they travel in harmony with nature. Each canoe is built on a form. Ribs are steam bent and the planking is fitted and fastened to the ribs. The canoe is then removed from the form. The wood is sealed and varnished before the canvas is applied. The canvas is stretched, fastened, filled and painted. It is not bonded to the hull, but attached at the gunwale edge so the wood can expand and contract underneath it with temperature changes. 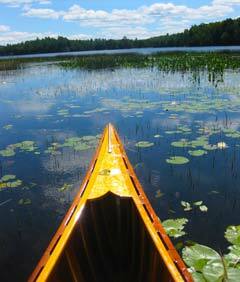 The canvas makes the canoe waterproof allowing the spirit of the wood to move and react to nature. A two year old seasoned brush is used for the final coat of varnish to ensure a clean finish. 15' width at gunnel 31"
width at 4" waterline 32"
15' available in solo version 16' width at gunnel 32"
width at 4" waterline 33"
weight 40-60 pounds Weight varies on both canoes depending on the covering and trim materials. All wood is pre-sealed to prevent weight gain and rot. Canvas is filled with oil based filler and painted with four coats of marine enamel. Wood is varnished with 4 coats of marine spar varnish and five coats on trim. Will has been featured in the June 17, 2011 issue of "Country Roads: Discovering Hastings County" that can be found here.